Bosphorus Cymbals Master Vintage Hi-Hat Bottom Cymbal 14 in. The Bosphorus Master Vintage Hi-Hat Bottom is a true hand forged instrument of uncompromising quality, beauty and aural nuance. These rare treasures offer up a dark, dry fundamental tone, precise articulation, and an organic earthy response. Throaty and full-bodied the Master Vintage Hi-hats are the perfect companion to all Master family rides. At moderate volumes these cymbals are crisp and tight. When played half-opened the hi-hats breathe a thick blanket of sound. 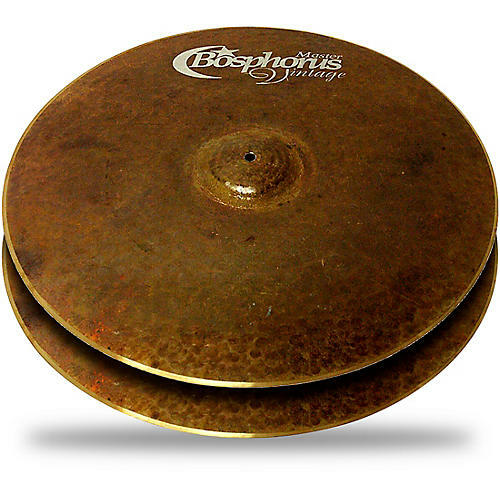 They're 100% handmade cymbals made of traditionally casted Turkish bronze.